Rheumatologists, primary care clinicians, including family physicians, internists, hospitalists and physician assistants. Cush JJ. Early rheumatoid arthritis – is there a window of opportunity? J Rheumatol Suppl. 2007;80:1-7. Roberts LJ, Cleland LG, Thomas R, Proudman SM. Early combination disease modifying antirheumatic drug treatment for rheumatoid arthritis. Med J Aust. 2006;184:122-125. Scott DL. Early rheumatoid arthritis. Br Med Bull. 2007;81-82:97-114. Sizova L. Approaches to the treatment of early rheumatoid arthritis with disease-modifying antirheumatic drugs. Br J Clin Pharmacol. 2008;66:173-178. Mader R, Keystone E. Optimizing treatment with biologics. J Rheumatol Suppl. 2007;80:16-24. Gibofsky A. Combination therapy for rheumatoid arthritis in the era of biologicals. HSS J. 2006;2:30-41. Yazici Y, Shi N, John A. Utilization of biologic agents in rheumatoid arthritis in the United States: analysis of prescribing patterns in 16,752 newly diagnosed patients and patients new to biologic therapy. Bull NYU Hosp Jt Dis. 2008;66:77-85. Kiely P, Williams R, Walsh D, Young A; Early Rheumatoid Arthritis Network. Contemporary patterns of care and disease activity outcome in early rheumatoid arthritis: the ERAN cohort. Rheumatology (Oxford). 2009;48:57-60. Saraux A, Devauchelle-Pensec V, Engerran L, Flipo RM. Most rheumatologists are conservative in active rheumatoid arthritis despite methotrexate therapy: results of the PRISME survey. J Rheumatol. 2006;33:1258-1265. Fautrel B, Guillemin F, Meyer O, et al. Choice of second-line disease-modifying antirheumatic drugs after failure of methotrexate therapy for rheumatoid arthritis: a decision tree for clinical practice based on rheumatologists’ preferences. Arthritis Rheum. 2009;61:425-434. 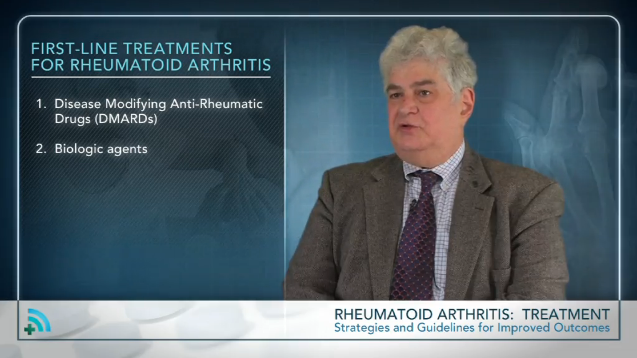 Increase the use of appropriate pharmacotherapy among physicians who treat patients with rheumatoid arthritis (RA). Improve the use of guidelines for initiating and changing therapeutic regimens in the treatment of RA. Philip L. Cohen, MD, is section chief of rheumatology, professor of medicine, and professor of microbiology and immunology at Temple University Hospital in Philadelphia. Dr. Cohen’s research interests include the mechanisms of systemic lupus and Sjogren’s syndrome. A graduate of the Yale University School of Medicine in New Haven, CT, Dr. Cohen was an internal medicine resident at New York-Presbyterian Hospital/Columbia University Medical Center in New York City and received research training in immunology and rheumatology at the National Institutes of Health in Bethesda, MD and the University of Texas Southwestern Medical School in Dallas. Dr. Cohen was a faculty member at the University of North Carolina School of Medicine in Chapel Hill and the University of Pennsylvania in Philadelphia, before moving into his current position. In accordance with the Food and Drug Administration, the speakers have disclosed that there is the potential for discussions concerning off-label uses of a commercial product/device during this educational activity. Any person who may contribute to the content of this continuing education activity must disclose significant relationships (and any known relationships of their spouse/partner) with commercial companies whose products or services are discussed in educational presentations. Significant relationships include receiving from a commercial company research grants, consultant fees, travel, other benefits, or having a self-managed equity interest in a company. Disclosure of a relationship is not intended to suggest or condone any bias in any presentation but is made to provide participants with information that might be of potential importance to their evaluation of a presentation. Philip L. Cohen, MD has disclosed that he receives research dollars from Janssen Biotech, Inc. The planners and managers have no financial or other relationship to products or devices with commercial interests related to the content of this CME activity. Review the full content of the activity. Successfully complete the post-test (80% or better). Complete the evaluation at the end of the activity. Statements of credit will be issued immediately online upon successful completion of the post-test/evaluation. In support of improving patient care, Creative Educational Concepts, Inc. (CEC) is accredited by the American Nurses Credentialing Center (ANCC), the Accreditation Council for Pharmacy Education (ACPE), and the Accreditation Council for Continuing Medical Education (ACCME) to provide continuing education for the healthcare team. CEC designates this enduring educational activity for a maximum of 0.25 AMA PRA Category 1 Credits™. Physicians should claim only the credit commensurate with the extent of their participation in the activity. Those involved in the development of this continuing education activity have made all reasonable efforts to ensure that information contained herein is accurate in accordance with the latest available scientific knowledge at the time of accreditation of this continuing education activity. Information regarding drugs (e.g., their administration, dosages, contraindications, adverse reactions, interactions, special warnings, and precautions) and drug delivery systems is subject to change, however, and the reader is advised to check the manufacturer’s package insert for information concerning recommended dosage and potential problems or cautions prior to dispensing or administering the drug or using the drug delivery systems.